Opale ... installed at Technal Middle East’s office in Bahrain. Opale ... in sync with modern styles. Kameshki. Workplaces in today’s world call for flexibility in order to make optimum use of space. Technal says its Opale system has been created to fit the bill. Technal, a leading international aluminium systems provider, says its Opale internal partition system offers the ideal solution to the modern-day trend towards sleek, versatile office space, marking a striking departure from the conventional environment of small cubicles or walls within walls. Today’s constantly evolving commercial environments demand greater overall visibility, space optimisation, high aesthetics, modularity and flexibility in configuration and this is exactly what the Opale range offers, according to Technal Middle East, the regional headquarters of the France-based aluminium façade, window and door systems specialist. 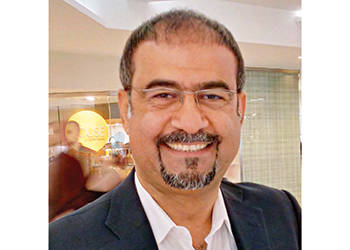 In addition, unlike other Technal systems that need to be installed by aluminium fabricators, the Opale system can be erected by various players in the interiors fit-out market such as office furnishers, interior decorators and carpenters, says Hesham Kameshki, marketing and business development manager. Elegant and versatile, Opale is designed for a range of environments including offices, commercial premises, hospitals and museums. The system also caters to the demand for flexibility in reconfiguring the internal area where expansion or diversification of businesses calls for constantly evolving workspaces. “The market, therefore, demands products that can be demounted, moved and rearranged conveniently to cater to an organisation’s need to expand and increase the number of workstations in order to accommodate its growing manpower requirements. And only unique products like the Opale partition system can fulfil such needs and deliver advantages,” says Kameshki. Elaborating on Opale’s design features, he says the system offers the possibility of creating framed partitions or using glazed panels that are fixed side by side for a sleek design, and can use a vast variety of infills such as plasterboard or woodchip panels, composite materials, clear glazing, screen-printed designs or safety glass. In terms of modularity, the Opale partition can be used as a single independent wall or multiple walls adjoining in a single point (two, three or four walls). It does not require modification or need to be cut for installation. Furthermore, the installation can be modified and modules interchanged easily. The system, which has European Technical Approval (ETA 07/0308), is moveable and removable and is shock resistant to hard and soft body impacts as well as horizontal pressure as tested without permanent deformation or surface alteration. “Opale solid standard partitions with plasterboard panels deliver an acoustic rating of up to 44 dB. The system has undergone the Schott flame guard test with glazed panels fixed side by side and has been classified as Class E 30 (PF30) in terms of fire resistance,” says Kameshki. Opale ... in sync with modern styles. The system comes in three assembly choices – standard partition, with a narrow rail or with recessed junctions – that suit all types of projects. Elaborating on the three different assembly systems, Kameshki says the standard partition offers an infinite range of configurations and combinations that are easy to move and to disassemble. It can comprise solid or glazed modules, which can be full height, on a solid apron wall, or comprise multi-transom or glazed panels that are fixed side by side. The second type of assembly – the flat partition with narrow and picture rails – offers a high level of finish and can be enhanced with a variety of decorative touches. 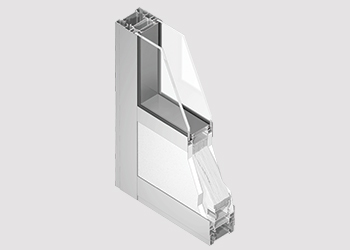 Full-height solid or glazed modules are available (fixed or moveable), as are glazed partitions on a solid apron wall, and multi-transom or glazed panels fitted side by side. It features an actuation system to adjust the flat partitions. Finally, the flat partition with a wooden recess junction is designed primarily to enhance the internal architecture. It features solid full-height modules that are moveable and removable. Opale further enhances the aesthetics of the interiors with vertical or horizontal frames, which can be customised with different beads, while the corners can be straight or rounded. It is also possible to integrate blinds or lighting between the skins of two glazed panels on a wall as well as separate the different electrical and computing wiring using cable channels comprising intelligent integrated trunk frames, which can be concealed or exposed. Opale can accommodate three types of doors – a 40-mm-thick wooden door, a 6.8- or 8.8-mm-thick safety glass door, or doors with aluminium frames – which are available in hinged and full-access slider versions. 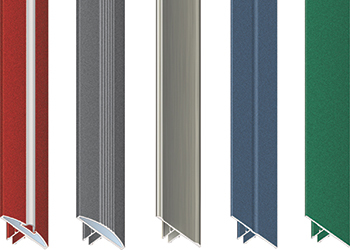 A wide range of finishes and colours is available for the Opale system to meet individual project requirements and enhance existing buildings. Anodised, polyester powder coated and lacquered finishes with exclusive Technal colours are offered for a stylish and contemporary look. Kameshki says Opale has already been installed on a variety of projects around the globe, including in the Gulf, particularly in office and commercial buildings. 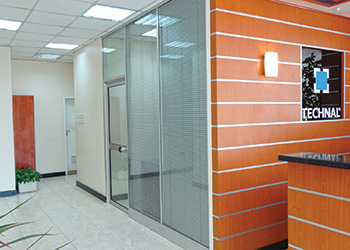 As a testimony to its faith in the system, Technal Middle East has installed Opale at its own head office and showroom in Bahrain, demonstrating the extensive range of internal architectural solutions it offers. “Those who are interested in installing the system can view the innovative solution that has been erected right here at our offices,” says Kameshki. Technal Middle East has been serving the regional markets for more than 35 years and offers a wide range of technically-advanced proprietary and bespoke products developed to meet specifiers’ requirements for increased thermal performance, design flexibility and visual appeal. These include innovative solutions for all types of architectural aluminium façades, skylights, sunshades, windows, doors, office partitions, balustrades and blast- and bullet-proof applications. “Technal architectural aluminium systems are renowned for their quality, innovative French design, durability and technical performance. All over the world, its aluminium systems give architectural projects intelligence and performance, right from the design stage and are increasingly specified and utilised in landmarks across the Middle East,” concludes Kameshki.